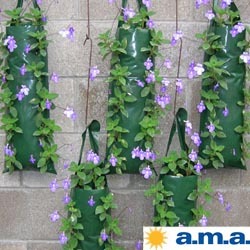 “Plant” your fence with flower pouches. Not just for fences, these flower pouches efficiently provide color and/or small veggies for tiny balconies, deck railings or other small areas. 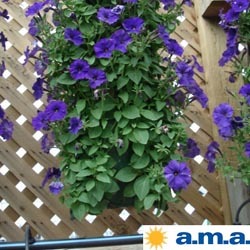 Better yet, they’re inexpensive, colorful and easy to plant. Available in different sizes, shapes and colors, flower pouches are small, heavy plastic bags with holes that are filled with soil and planted. After planting, they hang from hooks on fences, walls, decks, trees… Almost anywhere. Smaller versions may even be snuggled inside baskets or other containers that hang on the fence and conceal the bag. Many types of flowers, herbs and vegetables can be planted in pouches with great success. Smaller annuals, strawberries or vegetables are perfect for pouches. 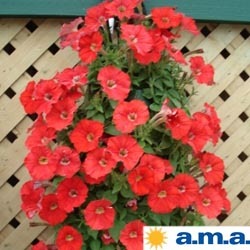 Petunias, marigolds, alyssum, lettuce and cucumbers grow famously. Plant early cool season flowers in early spring and replace with them with heat-loving annuals in the summer when they peter out. It’s easy to plant a flower pouch, especially when inserting smaller plants, seedlings or starts. Use a lightweight soil-less potting mixture. You may either completely fill the bag with the soil and then poke the roots of the plant into the holes or you can fill to the first set of holes, plant the starts, fill to the next level, and so on. Unless you are planting very small starts, most people find the “fill to the next level and plant” system works the best so delicate roots are not damaged. Many gardeners skip planting the lowest slots to provide more root space. Others skip the top slots in order to plant on top of the pouch, but you may experiment, of course. Tip: when planting the starts through the slots, use a dibble stick or dowel to create a downward sloping hole for the roots. This slant stabilizes the plant sooner as its roots grow and expand.